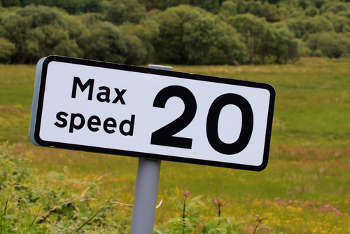 A new survey suggests that 20 million drivers in the UK believe it is acceptable to break the speed limit, with half of them admitting they don’t even realise they are doing it. The research by Direct Line Insurance suggests that the average speed at which motorists feel it is acceptable to drive above the set limit is 26mph in a 20mph zone (29% above the limit) and 56mph in a 50mph zone (12% above the limit). Over three quarters of those questioned admitted to speeding, with 5% saying they speed on every journey they make, while a further 12% said they speed on most of their journeys. When asked why they speed, half of speeders (51%) admitted to doing so without realising it, but slowing down when they notice. However, a third (34%) deliberately speed when the road is empty, while a fifth do so when they are running late. One in 20 admitted that they speed because they enjoy the thrill of driving quickly. Rob Miles, director of car insurance at Direct Line, commented, 'Speeding is one of the biggest causes of accidents and casualties on UK roads. The research suggests that it is often not deliberate, as drivers may be unaware that they may are creeping above the limit.